﻿﻿ It's 1946, soldiers are home and teens need a place to dance and have fun. They hear about a great band and they all crush into the Crooked Lake Pavilion to get close to the Big Stoop Chamberlain Orchestra. 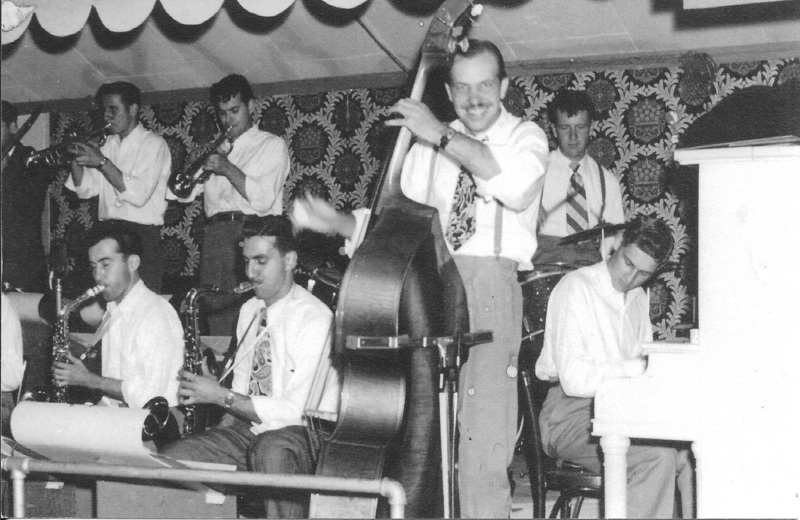 This band doesn't play Glenn Miller's sweet swing, they play bebop and Basie swing, and the new Latin sounds, Rhumbas, Merengues and Tangos. But there were broken beer bottle fights and one night . . . the place inexplicably burns to the ground. Everyone who had a great time at Crooked Lake finds out the band has moved to the Marigold Ballroom at twelfth and Nicollet, where the dancing is a bit less raucous but still fun. We don't play at the Marigold anymore, but Big Stoop is still going strong. Click on "Contact Ron Chamberlain", above, for more about us.